Bridges are building structures made to cross rivers, straits, ravines or highways. Bridges are also built for pedestrian crossings, two- or four-wheeled vehicles or trains. In Indonesia, many bridges are built across rivers or straits to shorten the distance or facilitate relations between a region to another. 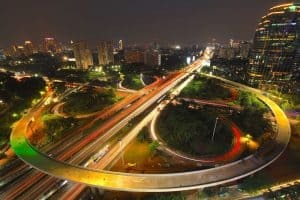 In Indonesia alone there are thousands of bridges that have been built by the government, of which there are several bridges that have beauty in terms of architecture and scenery. And here are the famous bridges in Indonesia. 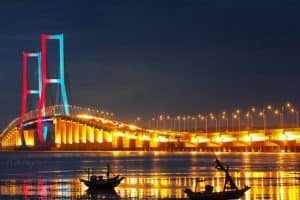 Suramadu National Bridge is a bridge that crosses the Madura Strait, connecting Java Island (in Surabaya) and Madura Island (in Bangkalan), East Java. With a length of 5,438 meters, this bridge is the longest bridge in Indonesia today. Suramadu Bridge consists of three parts, namely causeway, connecting bridge (bridge approach), and main bridge (main bridge). The name Suramadu itself is an acronym from Surabaya-Madura. The bridge was inaugurated by President Megawati Soekarnoputri on August 20, 2003 and was officially opened by President Susilo Bambang Yudhoyono on June 10, 2009. This bridge is basically a combination of three types of bridges with an overall length of 5,438 meters with a width of approximately 30 meters. This bridge provides four-lane two-way width of 3.5 meters with two emergency lanes as wide as 2.75 meters. The bridge also provides special lanes for motorcycle riders on each side of the bridge. 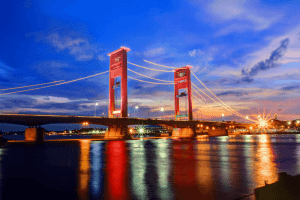 The Ampera Bridge is a bridge located above the Musi River, Palembang, South Sumatra. With a length of 1,117 meters, this bridge is the 4th longest bridge in Indonesia. The construction of this bridge began in April 1962, after obtaining approval from President Soekarno. The construction costs were taken from Japanese war reparations. Not only fees, this bridge uses experts from the country. At first, the center of the bridge body can be lifted up so that the bridge pole passing under it is not caught by the bridge body. The center of the bridge can be lifted with mechanical equipment, two ballast pendulum of about 500 tons each in the two towers. The lifting speed is around 10 meters per minute with the total time needed to lift the bridge full for 30 minutes. At night, the bridge is very beautiful with light and more vibrant with the presence of floodlights from the top of the two bridge towers. On the side of the bridge is also an open area (Plaza Kuto Besak) and floating restaurants. 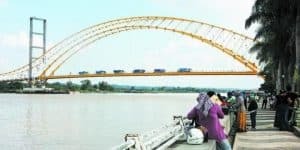 Barito Bridge is a bridge that connects the western edge of the Barito River in Anjir Muara District and the eastern edge of the Barito River in Alalak District near the City of Banjarmasin, South Kalimantan. 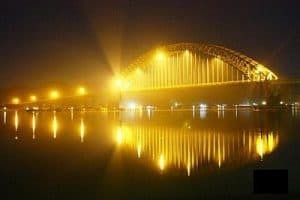 The bridge has a length of 1,082 meters across the Barito River 800 meters wide and 200 meters wide Bakut Island. The bridge consists of a main bridge 902 meters long, and a 180-meter approach bridge, with a width of 10.37 meters. This bridge is the access of Trans Kalimantan Road from Banjarmasin to Palangkaraya and vice versa. The Barito Bridge is often called the Bakut Island Bridge, according to the name of the delta (small island) below or the Bakumpai Island Bridge, according to the name of the western edge of the Barito River (Banjar River). The bridge was targeted to be completed by the end of 2008. Then the President of the Republic of Indonesia Susilo Bambang Yudhoyono inaugurated the Mahulu Bridge on July 15, 2009, along with other projects that are being activated in East Kalimantan. It has a central span of 200 meters with an overall length of 789 meters. The length of the bridge does not include the approach road. The width of the bridge is 11 meters, while the height of the bridge with river water surface is 18 meters. This bridge has a steel ring span that is characteristic of this bridge. 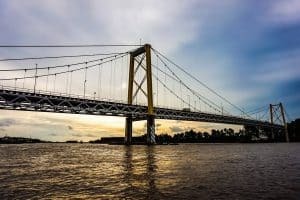 Barelang Bridge (also known as Habibie Bridge) is the name of 6 bridges connecting the islands namely Batam Island, Tonton Island, Nipah Island, Rempang Island, Galang Island and Galang Baru Island. 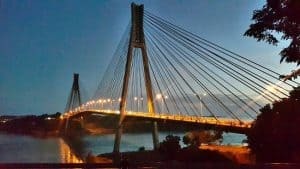 Local people call it “Barelang Bridge”, but there are also those who call it “Bridge of Habibie”, because he initiated the construction of the bridge to facilitate the three islands designed to be developed into industrial areas in the Riau Islands. The 8th longest bridge in Indonesia, which is located above the sea, is now the main tourist attraction of the Riau Islands because it offers a panoramic view of the South China Sea. Jembatan Merah Putih is a Piring Cable Bridge located in Ambon City, Maluku Province. 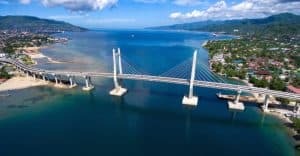 The bridge straddles Teluk Dalam, Ambon City, which connects Desa Rumah Tiga (Poka) Sub-district of Sirimau on the north side and Desa Hative Kecil in Kecamatan Teluk Ambon on the south side. This bridge is the Longest Bridge in Eastern Indonesia and one of the Most Famous Bridges in Indonesia. The 1,140 meter bridge began to be inaugurated on April 4, 2016 by the President of Indonesia, Joko Widodo, with a cost of around 779.2 billion. 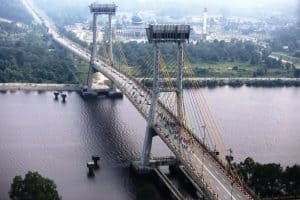 Kutai Kartanegara Bridge is one of the Longest Hanging Bridges in Indonesia that crosses the Mahakam River. 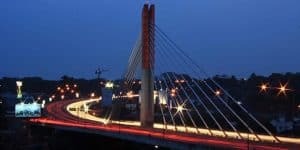 The 710 meter bridge with free span or area that is hanging without a buffer reaching 270 meters is a connecting bridge that connects Tenggarong City with Tenggarong Seberang District to Samarinda City. The bridge that had collapsed on November 26, 2011, then rebuilt in 2013 was officially opened to the public on December 8, 2015. All Kutai people have been accustomed to using this bridge access until now. Semanggi Bridge is one of the Most Beautiful Bridges in Indonesia which was built in 1951 during the reign of President Soekarno. The bridge with a very beautiful shape like the leaves of the Semanggi tree was built in the Karet Semanggi area, Setabudi, DKI Jakarta Province, Indonesia to welcome the 1964 Asian Games. Clover leaf shape was chosen by Sukarno because it was considered a symbol of national unity. Four parts of the leaf resembled the tribes in Indonesia, then were united into a single unified leaf. Cloverleaf is also likened to “suh” or broom stick binder. Rod sticks united by “suh” will become sturdy. Tengku Agung Bridge Sultanah Latifah (also known as the Siak Bridge) is a bridge that crosses over the Siak River, Siak Sri Indrapura City, Riau. The name of the bridge is taken from the name of the consort of the last Sultan of the Sultanate of Siak, Sultan Syarif Qasim II. The bridge that was designed to be more than 100 years old was built through a cable stayed system, with modern construction. Siak Bridge was designed since 2001 by the Expert Team from ITB, has a length of 1,196 meters, a width of 16.95 meters plus two sidewalks 2.25 meters wide which flank the right and left sides of the bridge. The height of the Siak Bridge reaches 23 meters above the water level of the Siak River which is about 300 meters wide. On the bridge stand two towers as high as 80 meters each, equipped with two elevators to get to the top of the tower. Pasupati Bridge or Pasupati Flyover is a bridge that connects the north and east of Bandung City through the Cikapundung Valley. Its length is 2.8 kilometers and its width is 30-60 meters, is the second longest bridge in Indonesia. The construction of the bridge was financed through a grant from the Government of Kuwait. After several years of failure, finally on June 26, 2005 the first trial was carried out. This bridge will be one of the landmarks of Bandung City. Pasupati Flyover is also one of the icons of Bandung City. This overpass makes the traffic flow from the Greater Jakarta area to Bandung easier. All in all, those ten bridges have the beautiful view at night. After knowing them, are you interested to visit the city just for seeing the bridges?